With Fabric & Thread....a wonderful give away! - Stop staring and start sewing! With Fabric & Thread....a wonderful give away! 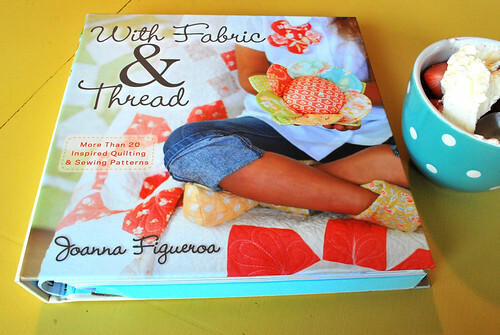 I was thrilled when the good folks at Wiley Publishing asked if I'd be interested in reviewing Joanna Figueroa's new book With Fabric & Thread. I asked if they'd let me give away a copy to my readers and they were very obliging (so the answer was yes!). I was even more thrilled when the book showed up here. I hadn't seen the cover previously so I let out a gasp when I pulled the book from the box. Seriously...look at how absolutely dreamy this cover is. I've had the pleasure of spending time with Joanna at Quilt Market on a few occasions and can vouch for the fact that she is a warm, down to earth person and a real hoot as well. I LOVE the fact that she includes a great deal of her life story in the book and reading it just made me love her more. Did you know she was born in Poland and moved here as a toddler? She shares a wonderful story about sewing on the flight over to America when she was 3 years old. She shares her journey from crafting to quilting to designing fabric (and such beautiful fabric it is). Right away this book won me over just by the way Joanna share so much of her heart and life with the reader. But that's just the beginning. This gorgeous (really, it's such a treat for the eyes) book is loaded with swoon worthy projects. From delicious quilts (this new quilter really appreciates the beautifully illustrated instructions), to sweeties for your home like aprons, basket liners, and these darling scalloped shams, Joanna generously gives over 20 projects in this beefy, spiral bound book. In the back of the book is a big pocket holding the pattern pieces and thankfully they are printed on a nice, heavy stock white paper. It's perfect for tracing and saving and you'll never run out of fresh inspiration with this sitting on your coffee table. I honestly don't think I can do this book justice with my description so if you get a chance to see it in person at a book store take the time to flip through it. I guarantee you'll be leaving with it tucked under your arm (just be sure to pay for it first). But I will be having a drawing later this week for some lucky reader to recieve a copy of the book straight from the folks at Wiley. Just leave a comment sharing your all time favorite musical band (you were expecting something related to sewing weren't you? ha!). I'd have to say mine is Abba with The BeeGees coming in a close second. And take a look at my etsy shop (on the left sidebar there) because I've added a bunch of goodies and some of them will make great gifts for Father's Day (you still have plenty of time). Have a great week!